FILE - An aerial photo of Mercedes-Benz Stadium in Atlanta, Ga., Sep. 21, 2018. 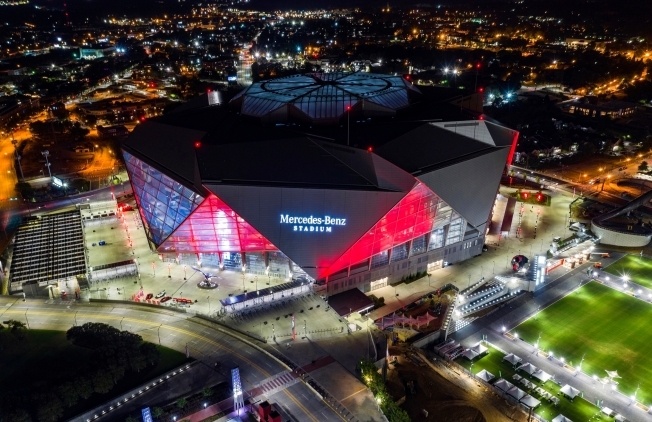 When Super Bowl 53 kicks off less than two weeks from now, legions of police and federal agents will be positioned to protect fans inside and outside the Atlanta stadium where the New England Patriots and the Los Angeles Rams face off. Authorities won't discuss specifics of their security plan. But they say they will safeguard areas beyond the downtown Mercedes-Benz Stadium and make officers visible across the city. The city's police department has worked with more than 40 state, federal and local law enforcement agencies to develop the plan, Atlanta Police Chief Erika Shields said. Officers will work 12-hour shifts and will "position ourselves so that we can react immediately to whatever scenario we are confronted with," Shields said. "Our main focus at that time was on the Olympic Village," said Richard Stogner, who was in charge of finances for the Olympics and as such was involved in security meetings weeks and months before the games. Stogner witnessed the deadly violence from his office overlooking the park. He recalled walking onto his balcony and seeing a large cloud of white smoke and at least a couple of people lying on the ground. In the days leading up to the Super Bowl on Feb. 3, the park -- which has been closed off with double rows of chain-link fencing in some places -- will play a central role as it hosts numerous concerts and other game-related celebrations.